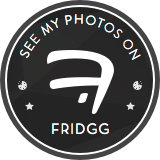 Today I am going to share with you the best pineapple cheesecake I ever made/tasted. This is truly something everyone should try. This is a very easy homemade cake recipe, especially because it's no bake. If you are not a big fan of pineapple, you can easily replace it with any fruit you want. I love trying multiple versions of one recipe until I find the perfect one. That's why I have another Pineapple Cheesecake recipe. But let me tell you, this one is way more delicious! If you are having trouble with measuring the ingredients, this post might help you out. Here you can find baking conversion charts that will help you with the metrics. First of all, let me tell you something about the gelatin. In my other pineapple cheesecake, I used gelatin sheets. You can use them in this recipe too. I will make have a tutorial on how you can use any gelatin you want, just click right here. For this cheesecake, I used the detachable walls of a round tin of 26cm. You can use a smaller/bigger one, and depending on that your cheesecake will be smaller/bigger. I only used the wall side of the tray and a normal cake plate. Now, let's make this delicious pineapple cheesecake. Blend the digestive biscuits, and put them in a bowl. In the picture below, you can see that I used my little blender for this. Heat up the butter, and pour it onto the biscuits. Now blend the composition well. Put it on to the plate, and make sure you even out very well the cake crust. You can use a glass, or if it's more comfortable you can use your hand. Put the cake crust in the fridge for about 30 minutes, until you make the cream. Put the gelatin in the warm milk, and mingle it a little with a teaspoon. Let it sit for 10 minutes. Meanwhile, mix the cream cheese with the powdered sugar. Then, gradually add the whipped cream. (the whipped cream should be liquid, don't wipe it before you use it). This should take about 10 minutes, and your gelatin should be done. Add the gelatin over the cheese composition, and mix it for about 1-2 minutes. Put the fruits into the composition, and slowly mingle it using a wooden spoon. And the cream is done. Take out the cake crust from the fridge, and put the cream over it. Make sure the cream is spread evenly. You can tap a little the plate for a little help. At this point, the cheesecake has to stay in the fridge for about 5 hours. I know the waiting time is long, but trust me, it's so worth it! For the jelly, put the pineapples and the sugar in a pot, and put it to boil. From the moment it starts to boil, count 5 minutes, and then take it off the stove. Now mix the resulted composition. You can mix them even if the fruits are hot, it won't happen anything bad to them. You have to mix it until you have a fruit puree. Now mix the resulted composition. You can mix them even if the fruits are hot, it won't happen anything bad to them. You have to mix it until you have a fruit puree. Put the gelatin in the 100ml cold water, and let it sit for 10 minutes. Until this, you can leave the pineapple puree cool at room temperature. After the 10 minutes are up, add the gelatin to the puree, and mingle it very well. 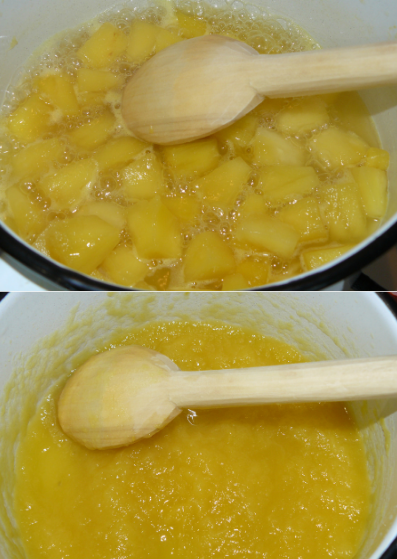 And your pineapple jelly is done. Put it on the cheesecake, and leave it in the fridge for about one hour. As I said at the beginning of the post, this is the best pineapple cheesecake. Everyone loved it! And of course, if you are not a big fan of pineapple, you can substitute it with any fruits you like better. What do you think? Would you give it a try? Don't forget to share with your family and friends! I'm not a huge pineapple fan so I would need to rearrange the recipe s bit. Would this work as well with strawberries maybe? Of course! Just keep the same amount of fruits. I love pineapple, I like this idea! Maybe a pineapple "upside down" cheesecake would be fun to try! I love pineapple! This cake looks easy to make and it looks delicious! You perfected the crap outta this baby!!! Looks amazing ! I love cheesecake, but only with strawberry or cherry! LOL, that's the only thing I would change! I am such a fan of pineapple! And I find that no bake cheesecake tends to be a bit creamier than the baked version (and no dreaded crack down the center!) I want to try this with some mango! I love pineapple and cheesecake, so this looks amazing! I will have to give it a try. Pineapple cheesecake!? Yum!! I definitely need to try this. My husband would LOVE it!!! 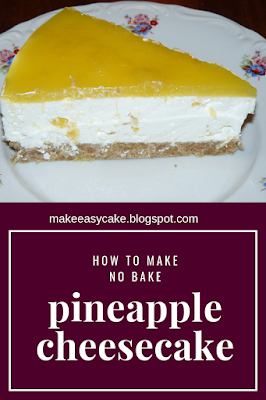 I love pineapple and this makes a great topping for cheesecake. This is a recipe that I need to make. It looks really good, which is why I have to try to cook the ingredients are my favorite flavors. Ooo I'm sure I'd love this. I just love cheesecake. It looks amazing, a perfect dessert! Oh my goodness this sounds absolutely delicious. I bet pineapple cheese cake is absolutely amazing. I absolutely love cheesecake and pineapple, so this sounds amazing! My birthday is next week so I think I am going to make this for my cake! I love pineapple cheesecake! And this recipe looks soo good! Definitely going to give it a go. This looks so simple! pineapple is in season at the moment! I need to try and do this one with my family! I'm not much of a fan of fruity cheesecake. I'm not sure why, but it's never been my thing. Nothing is more flavorful than this cake. I can imagine how kids would love it. So simple to make and follow. I'm conflicted. I LOVE cheesecake, but I'm not a huge fan of pineapple. Nonetheless I totally still want to try this. My son’s fabulous fruits is strawberries and pineapple. That looks really yummy. I will definitely try that recipe then try it with strawberries too. I love pineapple, it has such a great flavour! it must be amazing in a cheesecake! Oh my goodness you had me at pineapple and cheesecake! Two of my favorite things!! That sounds so good! I would never have thought to put pineapple with cheesecake. I've always used berries or chocolate. This would be nice for a change. I don't usually go to cheesecake when I want a dessert, but the pineapple topping to this one really intrigues me. Looks yummy! It does look pretty marvelous. I love a good cheesecake and pineapple is delicious. I am curious about the flavor combination. Something about this recipe reminds me of an upside down pineapple cake. This looks equally delicious and I can almost taste it. I really love the sounds "easy" and I will surely give this a try. I can't wait to make this recipe!! Yum! After mangoes pinnaples are my jam. Anything with this healthy fruit calls my name. Will try this recipe after the carrot cake I made last week is finished. One cake a week is enough for my waitseline lol! This sounds very tasty. I would love to try my hands on the recipe one day. I love almost all cakes and cheesecakes, and this looks delicious! This looks soo delicious and I definitely try this one. Thanks for sharing. Wow...looks so yummy. Thanks for sharing 😊 Will try it out this weekend.